Fun Facts about Makeup & Cosmetics to Make You Smile | Shadi Welcome Pvt. Ltd.
Make up is the love of a girls’ life and it’s surely a feminine thing. There is a misconception that girls do wear makeup for guys but actually guys have nothing to do with neon green eye-shade or funky pink lip-color ;)Well it’s another long unseen track to squabble about. Egyptians were the first to use makeup. The women painted their eyes, applying dark colors under the eyelids and blackening their eye lashes. Kohl was the original eye makeup created from copper and lead by Egyptians. Egyptians also used to paint their nails with henna before nail-colors were invented. In ancient Egypt, the beauty regime was very complex. It began with a walk and applying incense pellets to their underarms as a form of deodorant. Then, while sitting at a mirror, servants brought grinders and applets used for daily makeup. The servants mixed malachite with oil derived from animal fat to create eye shadows and apply them with a small ivory stick carved on one end, and then lined the eyes with black kohl. Also, the red ochre was used as lipstick. In the era of Queen Victoria, make up was used to worn by actresses, working girls and prostitutes only. Upper class did not wear any makeup. In the era of Queen Elizabeth, coal tar was used for the same purpose we use eye pencils now; eye liner, eyebrow shading and mascara but it smelled too bad along with triggering blindness being flammable. In 1888, first deodorant was MUM invented and was a cream to be applied using fingertips, the manufacturers of MUM also invented the roll-on applicator some years later after being inspired by the Ball-Point pen. In 1400, being hairless was a trend for women. They literally bald all their heads and pluck their lashes & brows completely. Women literally used to tweak and pinch their cheeks to give them a rosy touch before the invention of blush. The toothpaste of Ancient Roman contained ammonia from human urine to whiten the teeth. Many of the celebrities use a popular therapy called “urine therapy” to stay healthy and beautiful in Hollywood. This includes rubbing your first urine of the day on your face, and / or drinking a few drops. To make lipstick and eye-shadow shimmers, ground fish scales are often used. 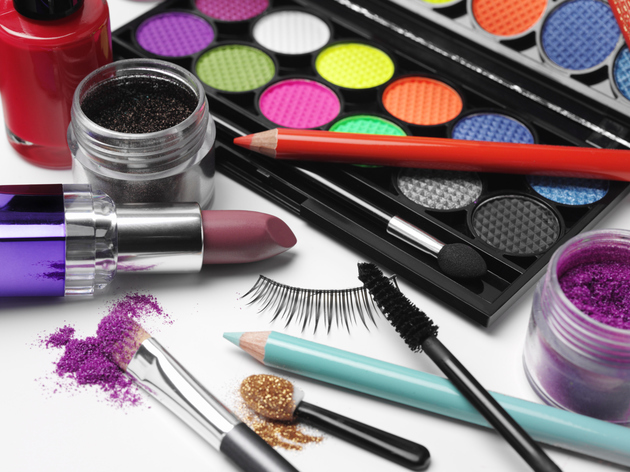 Cosmetic products are regulated and approved by by FDA and the authority can stop the sale if find any of them unsafe. Mouthwash, body washes, bubble baths and deodorants etc. are all considered as cosmetics. In 1770, British parliament passed the law condemning lipstick, stating that “women founding guilty of seducing men into matrimony by a cosmetic means could be tried for witchcraft”. It’s not advisable to match makeup skin tone check on your hands because you wash your hands more than face. It may result in choosing a wrong, darker or ruddier tone shade. The women in Morrisville, Pennsylvania need to get permitted first to wear makeup. 1 in every 3 women in the world won’t leave the house without putting the makeup on as per research. MAC stands for makeup Art Cosmetics. The inventor of Maybelline named the company after his sister’s name ‘Maybel’ who actually was his inspiration behind creating this brand line in cosmetics. Nestle owns a quarter of the world’s largest cosmetic company, L’Oreal. “Hypoallergenic” means that the product is made with ingredients least prone to cause allergic reactions. In 1915, underarm hair was first supposed to be unfeminine by the Wilkinson Sword razor company, after a woman appeared on the cover of Harper’s Bazaar magazine without any. The most common cosmetic problem in teenagers is acne. Keeping makeup products in the fridge increase their life. The United States has the highest rate of cosmetic surgery in the world. Coco Chanel popularized the trend of tanning after getting tanned in the cruise, fake tan started to flood the market soon after that. On contrary, skin whitening products are famous in Asia since Asians prefer pale skin. Dermatologically tested does not mean dermatologically approved. Share in comments if you have any more makeup facts that you think might interest the audience.